Background: Choice of health-care services depends on patients' characteristics and the features of health-care facilities available. In Nepal, a significant proportion of health care is provided through the private sector, despite the introduction of free essential health care for all citizens in 2008. We sought to determine whether people chose private or public facilities in the first instance for acute health problems. We also assessed the reasons for their choice. Materials and Methods: A cross-sectional survey was done by use of a questionnaire administered to 400 household heads in Jhapa district, Nepal. Results: 272 (68%) respondents sought treatment from public health-care facilities in the first instance. On adjusted analysis, illiterate people were more likely to choose public facilities than people with higher secondary education (OR 5.47, P = 0.002). Similarly, lower-caste and religious-minority respondents were more likely to choose public facilities than disadvantaged janajati (OR 2.33, P = 0.01). Among respondents who used public facilities, 174 (64.0%) and 109 (40.0%) stated that that their choice was based on financial accessibility and physical accessibility, respectively. Among respondents who used private facilities, 65 (50.7%) and 54 (42.1%) said their choice was based on adequacy of resources/services and health-care delivery, respectively. Conclusion: A substantial portion of respondents used public health-care facilities in the first instance, mainly because of financial and physical accessibility rather than adequacy of resources or better health-care delivery. These results may indicate a positive impact of removal of user fees for public health-care facilities in Nepal, especially for impoverished people. Nepal has a pluralistic health system with a variety of health-care facilities,  which can be broadly categorized into public and private. Public health facilities within Nepal's district health system include sub-health posts, health posts, primary health-care centres and district hospitals. Private health facilities range from formal hospitals, nursing homes, private practitioners (especially at clinics or private pharmacies), private medical colleges and nongovernmental organizations or community-run hospitals to informal practitioners such as faith healers. Available data indicate that their number and share in health provision has rapidly increased, especially in ambulatory care, in recent decades. The private share of total health expenditure in Nepal is 70%, of which about 85% comes from out-of-pocket payments indicating a significant involvement of private facilities in health provision in Nepal. The number of private hospitals increased from 69 in 1995 to 147 in 2008, whereas the number of public hospitals increased from 78 to 96 during the same time period. Similarly, there are almost twice as many hospital beds in the private sector (12 310) than in the public sector (6944) in Nepal. Nevertheless, information on private health facilities and the services they offer is scarce. After the declaration of the republic of Nepal in 2006, a new interim constitution was formulated, which declared health as fundamental human right. In 2007, the Government of Nepal introduced a new free essential health care service to be provided through the district health system. In the first phase, free essential health care services were offered to poor and vulnerable citizens attending primary health-care centres and district hospitals (up to 25-bed capacity). In January 2008, provision of free essential health care services was extended to all citizens, whether poor or not, through health posts and sub-health posts nationwide. Under this system, no charges are levied for registration, outpatient, emergency and inpatient services, or for essential drugs. In January 2009, free essential health services became available via primary health care centres and district hospitals. There is limited information on patients' choice of health care facilities in Nepal, particularly since the free essential health care service was implemented. We sought to ascertain patients' choice of first contact with acute/primary healthcare, their reasons for so doing and any demographic characteristics associated with this choice behaviour in Dhulabari primary health-care illaka of Jhapa district, Nepal. Ethical approval for this study was given by the ethics committee of BP Koirala Institute of Health Sciences; respondents provided written consent. Jhapa is the eastern plain (terai) district of Nepal that borders with India. Jhapa district has a total population of 688 109 within 137 301 households distributed over 47 village development committees and three municipalities. Jhapa district ranks eighteenth in the human development index among the 75 districts of Nepal; the adult literacy rate is 62%. The district has multiethnic composition with Brahmin, Chetri, Rajbanshi, Limbu, Rai, Tamang being the major castes. The district has plain landscape and good networks of roads. The district has 51 public health-care facilities including hospitals, health centre, health posts and sub-health posts. In addition, there are five private hospitals with several private pharmacies. The District Public Health Office, Jhapa has divided the district into 12 illakas for health administrative purpose. Each illaka consists of several village development committees and has at least one primary health care centre and several health posts and sub-health posts. This study was conducted in Dhulbari illaka. This illaka has one primary health-care centre and four sub-health posts and 21 562 households. All households are within an hour's travel of private and public health facilities. A cross-sectional household survey was done during October and November 2009. Population data including the number of households in the study area was available from the district development committee. 400 households were randomly selected from the study area. A pilot questionnaire was prepared to obtain information on household members': (i) sociodemographic characteristics;(ii) health problems including acute illness and injuries in the year prior to the interview; (iii) type of health-care facility chosen in first instance; and (iv) reasons for the choice of health care facility. The questionnaire was translated into Nepali and pretested on 25 households. The results of this pilot were used to make the questionnaire more locally appropriate. The most senior member of each household available at the time of survey was interviewed face to face by the second author. Data analyses were done with SPSS version 16. Choice of health care facility was coded as 1 if public and 0 if private. Logistic regression was done to calculate adjusted odds of use of public health-care facilities. Statistical significance was set at 95% confidence level and P < 0.05. Public health facilities were defined as those run by the government and all other nonstate health facilities were classified as private. The reasons for choosing the health care facilities were assessed by use of the four dimensions of perceived quality developed by Haddad and colleagues: (i) health personnel practices and conduct; (ii) adequacy of resources and services; (iii) health-care delivery; and (iv) financial and physical accessibility. We spilt the last dimension into two options and made five options in our questionnaire; unprompted reasons for choosing a particular health facility were matched to these options. Educational status was classified into five categories: (i) illiterate - never attended school; (ii) informal education-never attended school but knows how to read and write through informal learning; (iii) primary - up to 5 years of education; (iv) secondary - 6-10 years of education; (v) higher education - above 10 th grade. 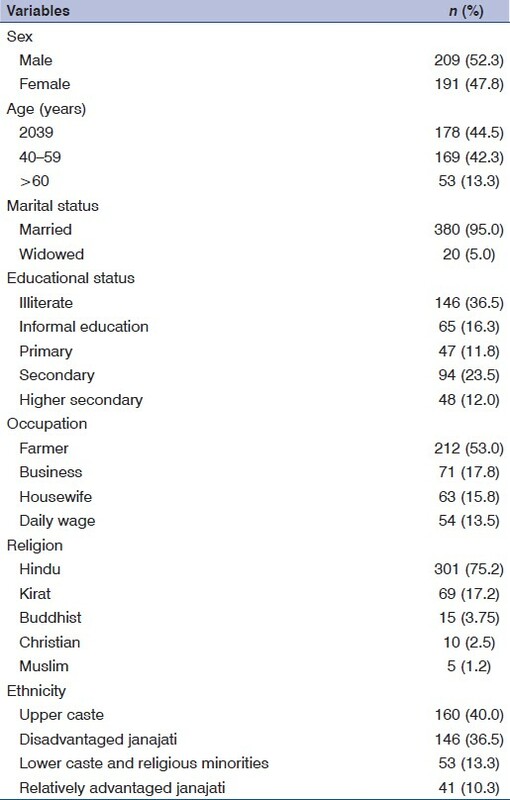 The Nepal Government's health-care classification was used to categorize ethnicity: Lower caste, disadvantaged janajati, religious minorities, relatively advantaged janajati and upper caste. 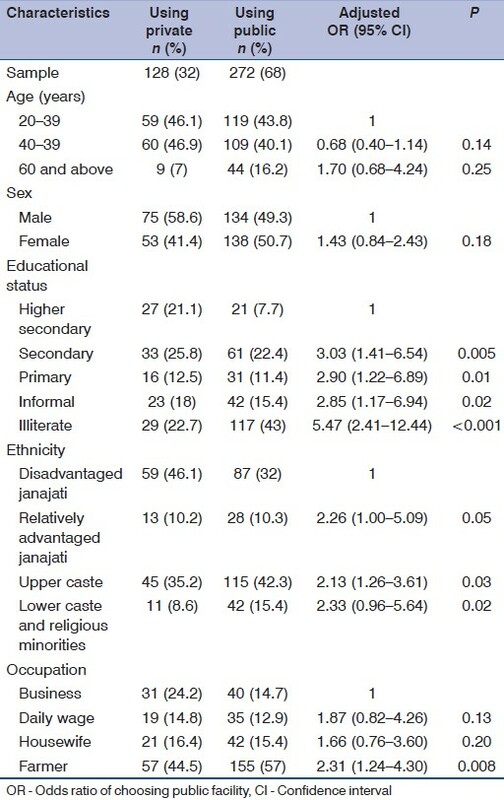 Sociodemographic characteristics of the respondents are shown in [Table 1]. About half the respondents were female and formally literate. Most of the respondents were aged 20-59 years (87%), Hindu (75.2%), upper caste (40.0%) and involved in farming (53.0%). Only 13 respondents were in the religious minorities category; their data were merged with those of the lower-caste group to facilitate analysis. All respondents had visited health facilities in the year preceding the interview to seek treatment either for themselves (243 [60.8%]) or for family members (157 [39.2%]). 272 (68.0%) respondents sought treatment from public health-care facilities in the first instance while 128 (32.0%) chose private health facilities [Table 2]. Respondents' reasons of choosing the type of health facilities are shown in [Figure 1]. Among the respondents who used public facilities, 64.0% (174/272) and 40.0% (109/272) said that their choice was due to financial accessibility and physical accessibility, respectively. Only 8.8% (24/272) of these respondents chose the public health facilities because of health personnel practices and conduct. Among the respondents who used private facilities, 50.7% (65/128) and 42.1% (54/128) stated that they chose private health facilities because of the adequacy of resources/services and health-care delivery, respectively. [Table 2] presents the results of logistic regression on choice of public facilities by selected demographic characteristics of respondents. On the unadjusted analysis, age, educational status and ethnicity appeared to be associated with choice of facilities. However, on adjusted analysis, only education and ethnicity were significantly associated. Illiterate people were more likely to choose public facilities than those in the higher secondary education group (odds ratio [OR] 5.47, P = 0.002). Similarly, people from the lower caste and religious minorities were more likely than disadvantaged janajatito choose public facilities (OR 2.33, P = 0.01). There are several limitations to interpret the results of this study. First, this study considered people's first-instance visit for all types of health problems including acute illness and injuries and did not investigate whether they revisited the facility of their first choice if required; some patients might have changed facility. Second, choice of facilities often depends on types of health services needed or on severity of illness, which we did not take into consideration. Third, this study was done in a relatively developed district with plain landscape, which would limit the generalizability of the findings to other parts of the country. 68% of people went to public health facilities at the first instance for their health problems. Ethnicity and low education status were significantly associated with choice of public health facilities. Public health facilities were chosen mainly because of financial and physical accessibility rather than better health personnel conduct and practices and health-care delivery, which might reflect a positive effect of the free essential health-care policy. Further comparative studies to investigate the association between type of health facility chosen and severity of health problems and frequency of visits will help elucidate the impact of the introduction of free essential health services in Nepal. 1. Thuan N, Lofgren C, Lindholm L, Chuc NT. Choice of healthcare facility following reform in Vietnam. BMC Health Ser Res 2008;8:162. 2. Yip WC, Wang H, Liu Y. Determinants of patient choice of medical provider: A case study in rural China. Health Policy Plan 1998;13:311-22. 3. Ager A, Pepper K. Patterns of health service utilizaton and perceptions of needs and services in rural Orissa. Health Policy Plan 2005;20:176-84. 4. Haddad S, Fournier P. Quality, cost and utilization of health services in developing countries. A longitudinal study in Zaïre. Soc Sci Med 1995;40:743-53. 5. Haddad S, Fournier P, Potvin L. Measuring lay people's perceptions of the quality of primary health care services in developing countries. Validation of a 20-item scale. Int J Qual Health Care 1998;10:93-104. 6. WHO. Health system in Nepal: Challenges and strategic options. Kathmandu: World Health Organisation, country office for Nepal, 2007. 7. Karkee R, Jha N. Primary health care development: Where is Nepal after 30 years of Alma Ata declaration? JNMA J Nepal Med Assoc 2010;49:178-84. 8. WHO. World Health Statistics. World Health Organization, Geneva: 2009. 9. RTI International. Overview of Public-Private Mix in Health Care Service Delivery in Nepal. North Carolina: Ministry of Health and Population, Government of Nepal and Research Triangle Park, 2010. 10. RTI international. Assessing implementation of Nepal's free health care policy: Third trimester health facility survey report. North Carolina: Ministry of Health and Population, Government of Nepal and Research Triangle Park. 2009. 11. District Development Committee, Jhapa. Jhapa District Profile, 2008. 12. United Nations Development Programme. Nepal Human Development Report 2004. Kathmandu: Empowerment and Poverty Reduction. 2004. 13. Government of Nepal. Nepal Living Standard Survey 2003/04: Statistical Report Vol 1. Kathmandu: Central Bureau of Statistics, National Planning Commission Secretariat. 2004. 14. Ha NT, Berman P, Larsen U. Household utilisation and expenditure on private and public health services in Vietnam. Health Policy Plan 2002;17:61-70. 15. Khe ND, Toan NV, Xuan LT, Erikssom B, Hojer B, Diwan VK. Primary health concept revisited: Where do people seek health care in a rural area of Vietnam? Health Policy 2002;61:95-109. 16. Lagarde M, Palmer N. The impact of user fees on health service utilization in low- and middle-income countries: How strong is the evidence? Bull World Health Organ 2008;86:839-48. 17. Agha S, Do M. The quality of family planning services and client satisfaction in the public and private sectors in Kenya. Int J Qual Health Care 2009;21:87-96. 18. Rao KD, Peters DH, Bandeen-Roche K. Towards patient-centered health services in India - A scale to measure patient perceptions of quality. Int J Qual Health Care 2006;18:414-21. 19. Orem JN, Mugisha F, Kirunga C, Macq J, Criel B. Abolition of user fees: The Uganda paradox. Health Policy Plan 2011;26 Suppl 2:ii41-51.